I admit that I am a traditionalist when it comes to Thanksgiving dinner. But still I like to add a new dish to the menu every few years. 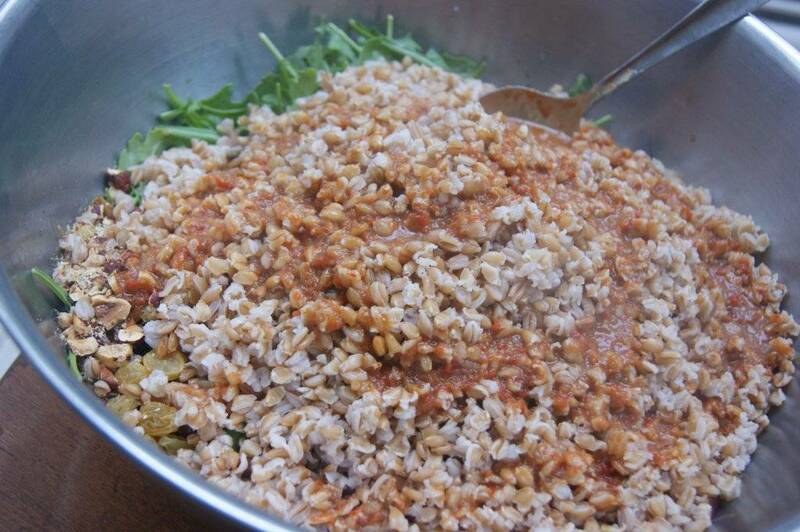 Last Thanksgiving I made a popular recipe, Warm Farro Salad, from my Great Grains cooking class. 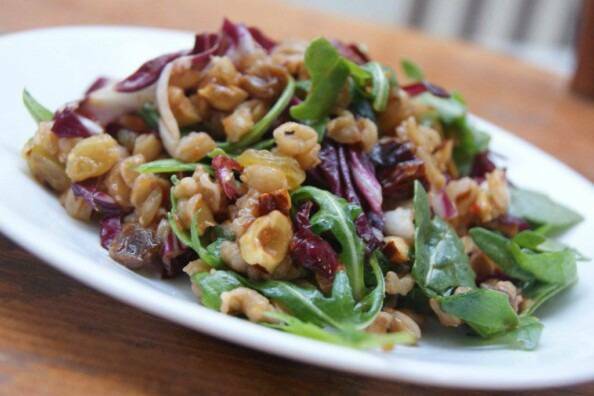 I thought the combination of nutty whole grain farro, roasted hazelnuts, and wilted winter greens would work well as a side dish to the usual harvest-inspired menu. Just as I hoped, Warm Farro Salad fit in perfectly, and was a huge hit. No doubt – the recipe tastes like a delicious cross between a grainy pilaf and a warm maple-infused salad. The bonus here is that all the salad components can be made a day or two ahead and mixed at the last minute. 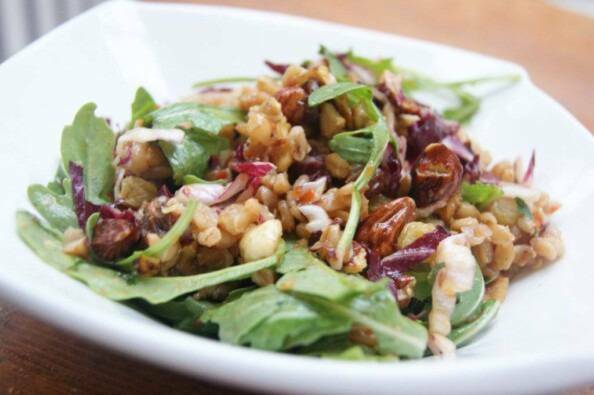 Warm Farro Salad can be also used as a vegetarian entree at any time of year, and leftovers can be eaten cold (or – what the heck! – reheated) for lunch. 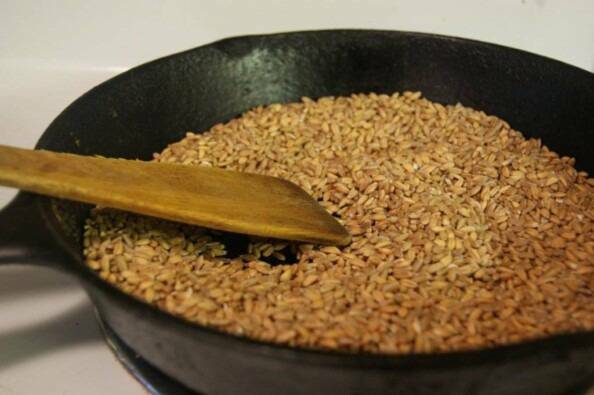 Other grains can be substituted for the farro. I’ve used both spelt berries and wheat berries to delicious effect, and I think a mixture of brown and wild rice would not taste too shabby. So, will I be making it again this year? That depends. I bought so many local cranberries on my Sunday tour of Saanich farms that I may have to invent some savoury way to use them up. 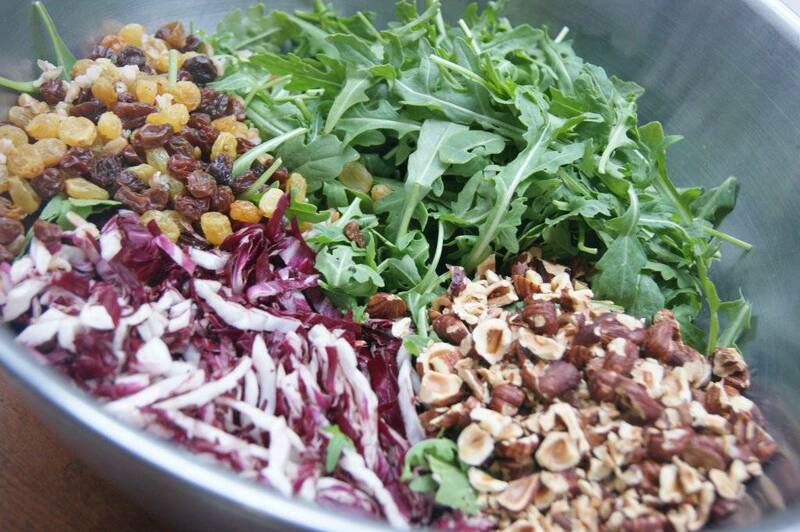 By the way, do you think fresh cranberries will taste good in this salad? Serves 8 as a main dish, 16 -20 as a side. This superb fall salad can be served warm or at room temperature, as a side dish or a vegetarian entree. 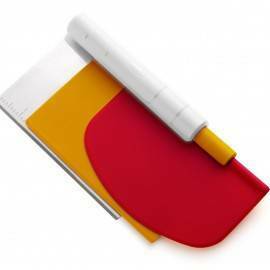 All the components can be prepared a day or two in advance and combined at the last minute. Leftovers keep well for up to 4 days. 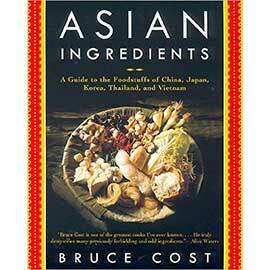 Recipe can be cut in half, if needed. Roast pepper over a gas flame, turning with tongs every few minutes, until skin is charred and blackened all over. Alternatively, halve, seed and roast peppers skin side up under the broiler of an electric oven. When blackened, place in a covered container for 15 minutes to loosen skins, then rub off the skins (remove seeds as well if roasted over a flame) and set aside. In the bowl of a food processor, puree the prepared pepper, garlic and shallots. Add remaining ingredients except oil and blend. With the machine running, slowly pour both oils through the feed tube and process until dressing is emulsified. Taste for salt. Heat a heavy-bottomed sauté pan, such as a cast iron pan, over medium heat. Add farro and toast, stirring, until they emit a nutty fragrance. Pour into a bowl and immediately add several cups of cold water. Swirl to rinse, drain and repeat, draining the farro well. Place in a medium pot, add 1 tsp salt and cover with 6 cups of stock or water. Bring to a boil, reduce heat to lowest setting and let cook farro grains are tender and most have opened, about 1 to 1-1/4 hours. (Spelt and wheat may take up to two hours). The grain should retain a substantial amount of “chew”. Drain farro. If you plan on serving the salad within 30 minutes, keep the grain warm. If not, let the farro cool and transfer to a tight container and put in the fridge. Toast hazelnuts on a tray in a 350°F oven, stirring frequently to ensure even toasting, about 7 minutes. While still warm, pour toasted hazelnuts into a metal sieve hanging over a bowl and use a clean kitchen towel to rub them vigorously to remove some of the skins. Scoop out the hazel nuts, leaving the skins behind, and chop them coarsely. To assemble salad: When ready to serve, heat dressing in a small pan until just warm. Place warm farro in a large bowl. If they are cool, reheat the grains in a plastic or glass container in the microwave for 3 minutes before placing them in the bowl. 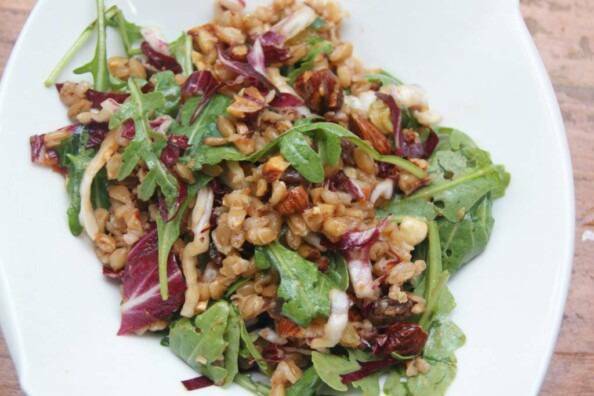 Toss the farro while still warm with the raisins, arugula, radicchio and half the heated dressing. Stir in half of the hazelnuts. Place on warm plates. Sprinkle each portion evenly with the remaining nuts and drizzle with the remaining dressing. (Alternatively, mix everything in a large bowl, transfer to warm serving dish and let people help themselves.) Serve immediately. 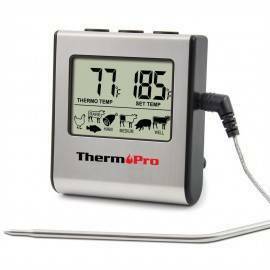 Leftovers keep for up to 5 days and can be served cold or reheated. not sure about fresh cranberries, but dried instead of the raisins would likely be very good. This looks great! I love me a nutty salad.